Dimensions: 11 11/16" square x 6 1/4"
This antique white card box may serve as an alternative guest book and charming decoration for the home. 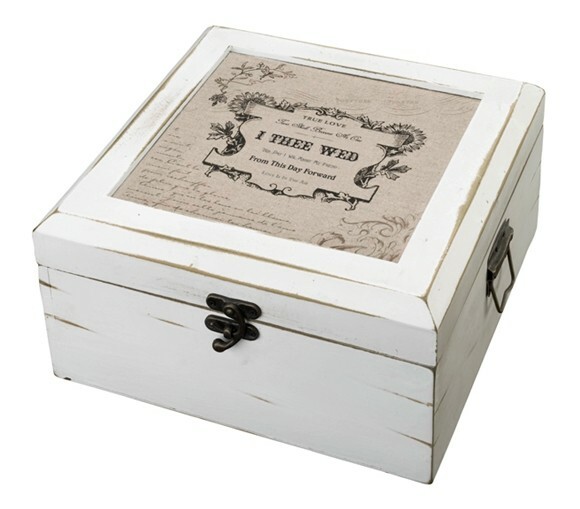 It features a wonderful frame design with the sentiments "True Love" and "I Thee Wed" inside the frame. Store your guests' wedding wishes cards (cards not included but available separately on our website) and drop them into the card box, which will become a treasured keepsake and piece of home decor for years to come. Non-personalized. The design is printed in black in the font styles shown only. Made of manufactured wood (MDF).